1 Chapter 13 - What is Selling? What is Selling? 2 Chapter 13 - What is Selling? What is Selling? n Helping Customers make satisfying buying decisions - The kind they will be happy with after the sale. 3 Chapter 13 - What is Selling? 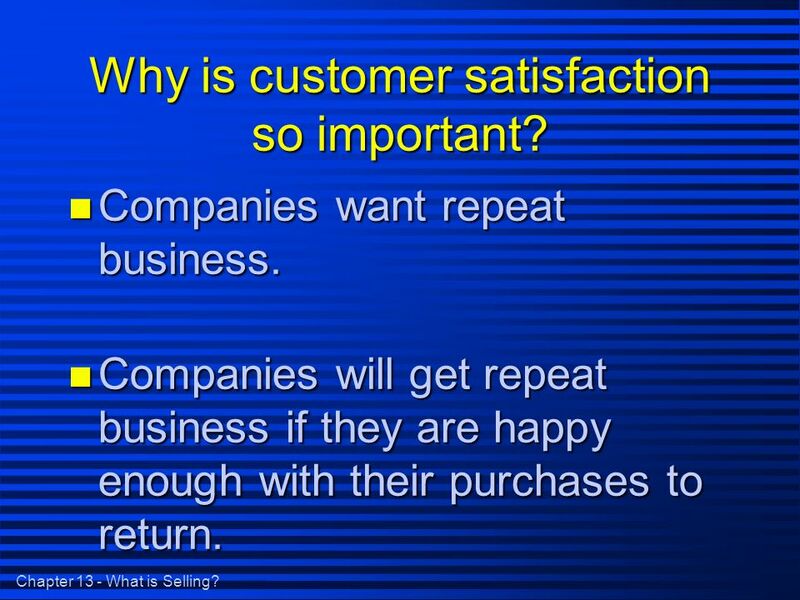 Why is customer satisfaction so important? n Companies want repeat business. n Companies will get repeat business if they are happy enough with their purchases to return. 4 Chapter 13 - What is Selling? Goals of Selling n To help customers decide on purchases. n To ensure customer satisfaction so the firm can count on repeat business. 6 Chapter 13 - What is Selling? 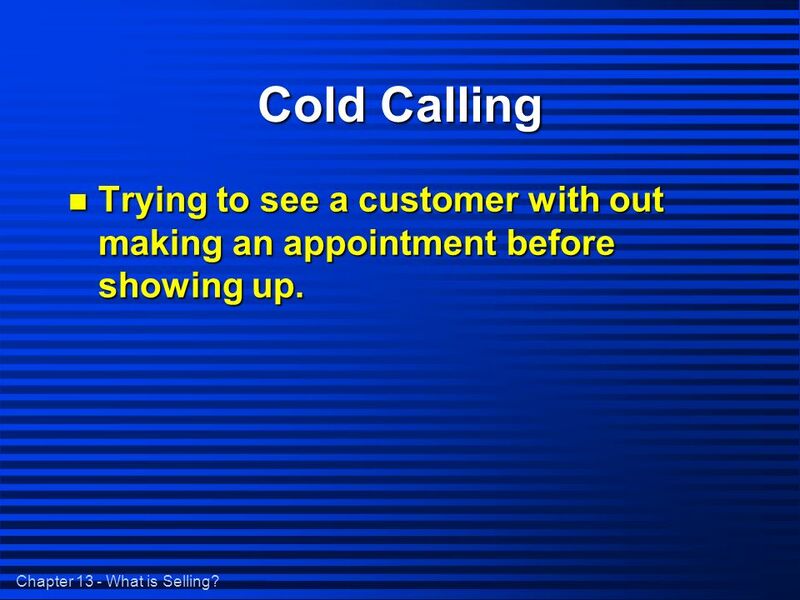 Cold Calling n Trying to see a customer with out making an appointment before showing up. 7 Chapter 13 - What is Selling? 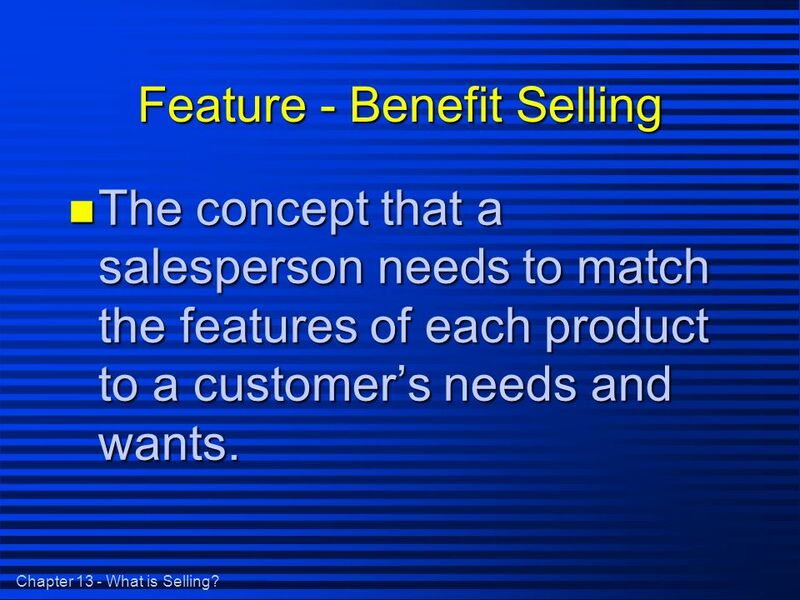 Feature - Benefit Selling n The concept that a salesperson needs to match the features of each product to a customers needs and wants. 8 Chapter 13 - What is Selling? 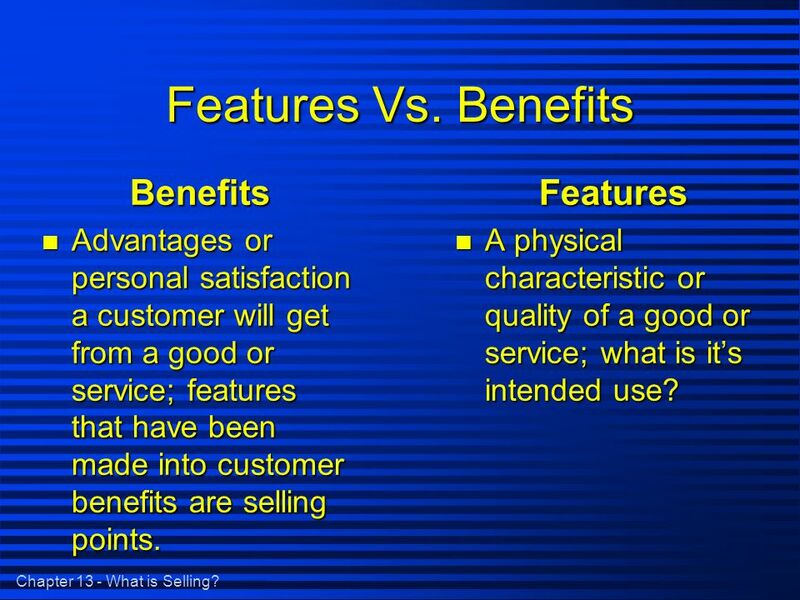 Features Vs. Benefits Features n A physical characteristic or quality of a good or service; what is its intended use? Benefits n Advantages or personal satisfaction a customer will get from a good or service; features that have been made into customer benefits are selling points. 9 Chapter 13 - What is Selling? 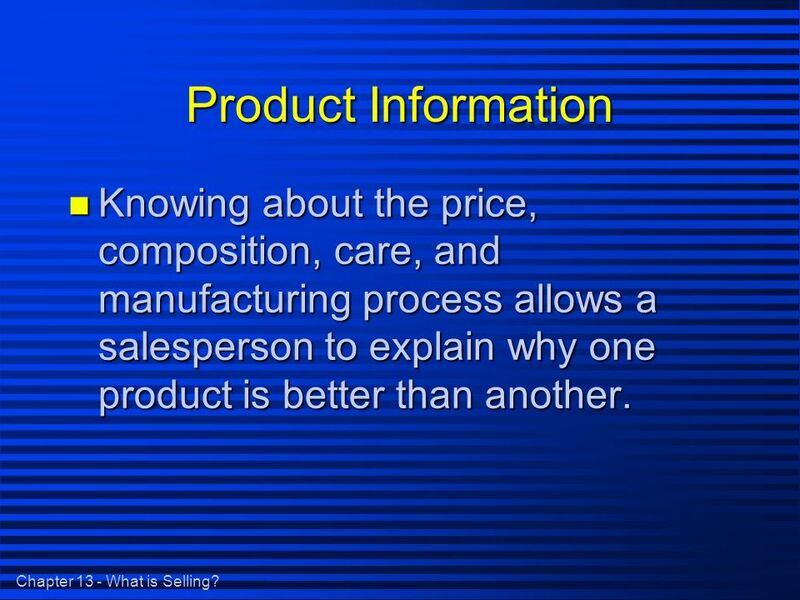 Product Information n Knowing about the price, composition, care, and manufacturing process allows a salesperson to explain why one product is better than another. 10 Chapter 13 - What is Selling? Where can you find information about a product? 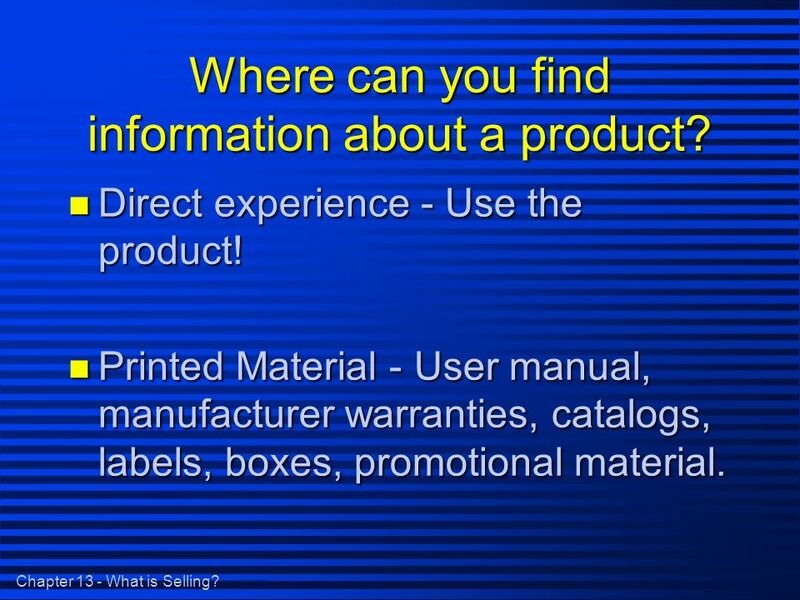 n Direct experience - Use the product! n Printed Material - User manual, manufacturer warranties, catalogs, labels, boxes, promotional material. 11 Chapter 13 - What is Selling? Where can you find information about a product? n Other people - Friends, relatives, and customers who have experience with the product. n Formal Training - Attending classes and observing experienced sales representatives before going out on their own. 12 Chapter 13 - What is Selling? 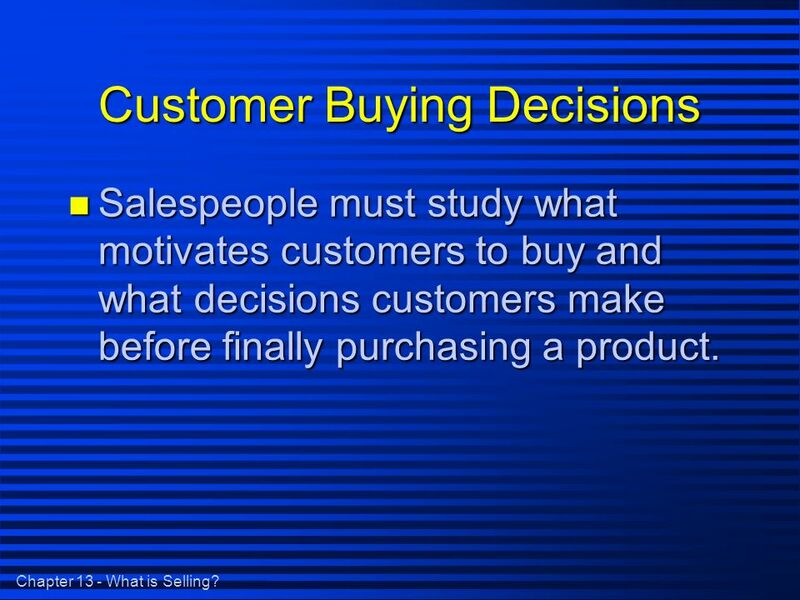 Customer Buying Decisions n Salespeople must study what motivates customers to buy and what decisions customers make before finally purchasing a product. 14 Chapter 13 - What is Selling? 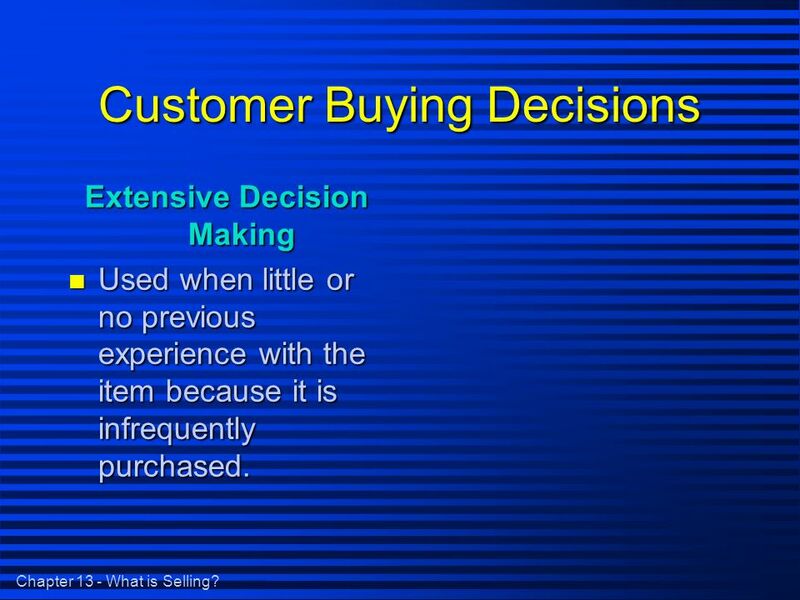 Customer Buying Decisions Extensive Decision Making n Used when little or no previous experience with the item because it is infrequently purchased. 15 Chapter 13 - What is Selling? 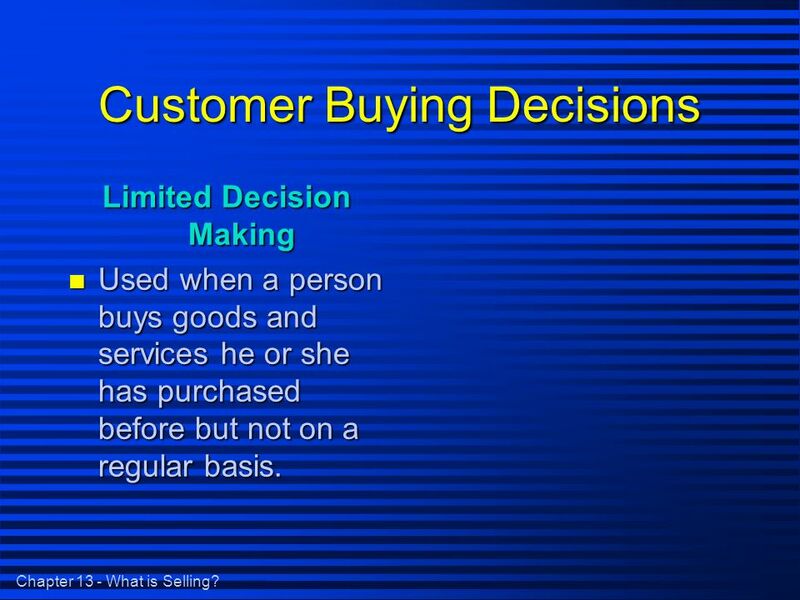 Customer Buying Decisions Limited Decision Making n Used when a person buys goods and services he or she has purchased before but not on a regular basis. 16 Chapter 13 - What is Selling? 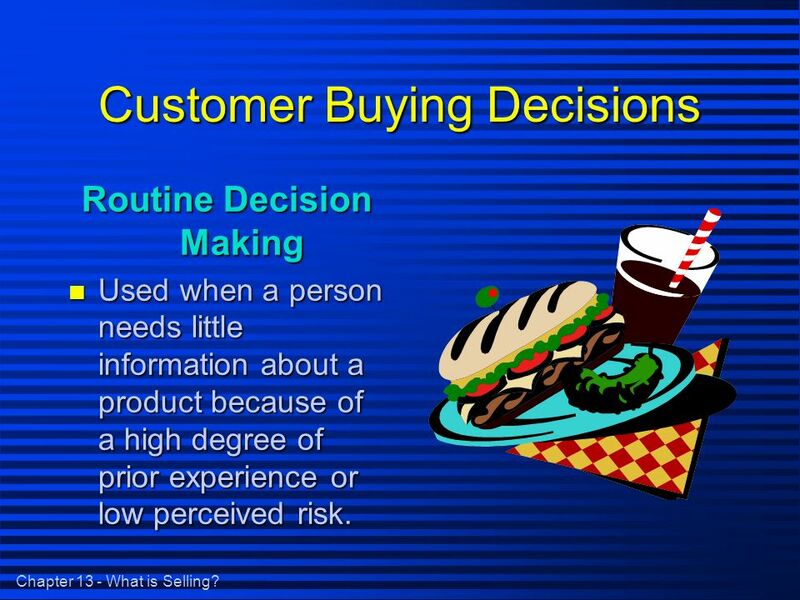 Customer Buying Decisions Routine Decision Making n Used when a person needs little information about a product because of a high degree of prior experience or low perceived risk. 17 Chapter 13 - What is Selling? 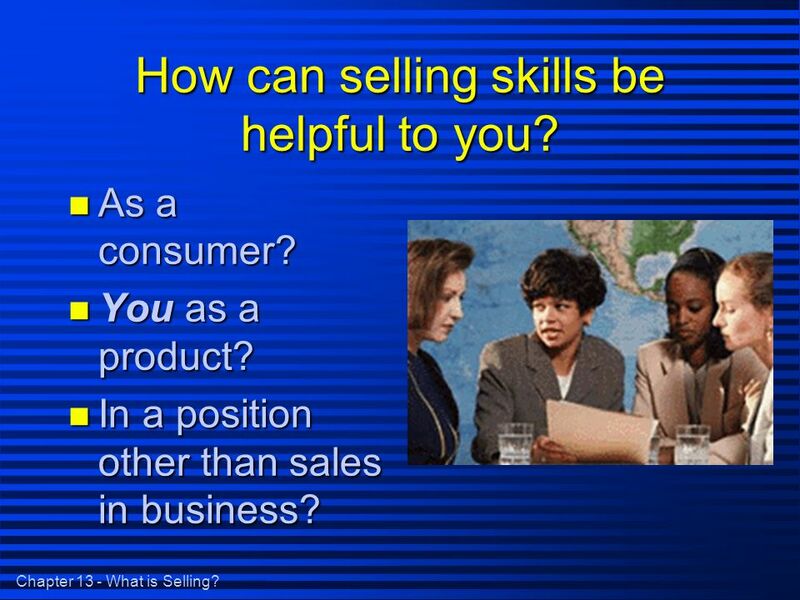 How can selling skills be helpful to you? n As a consumer? n You as a product? n In a position other than sales in business? 18 Chapter 13 - What is Selling? 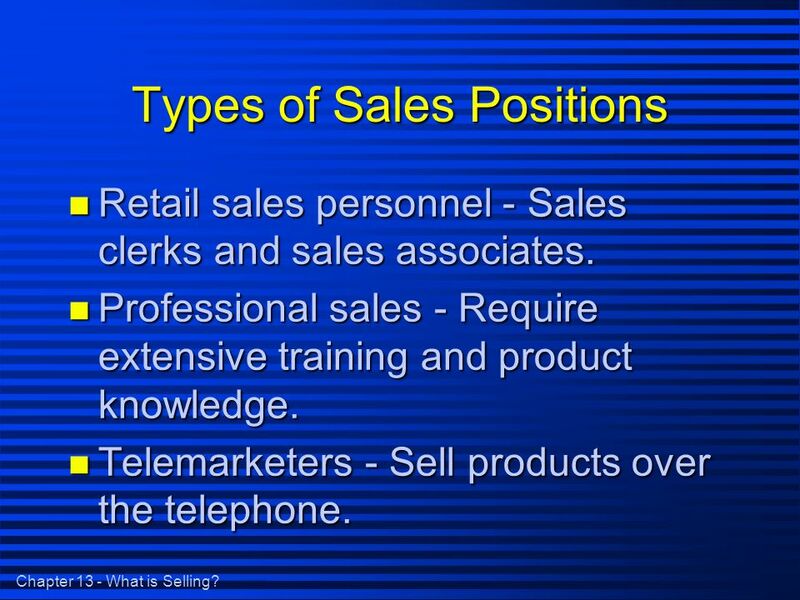 Types of Sales Positions n Retail sales personnel - Sales clerks and sales associates. n Professional sales - Require extensive training and product knowledge. n Telemarketers - Sell products over the telephone. 21 Chapter 13 - What is Selling? 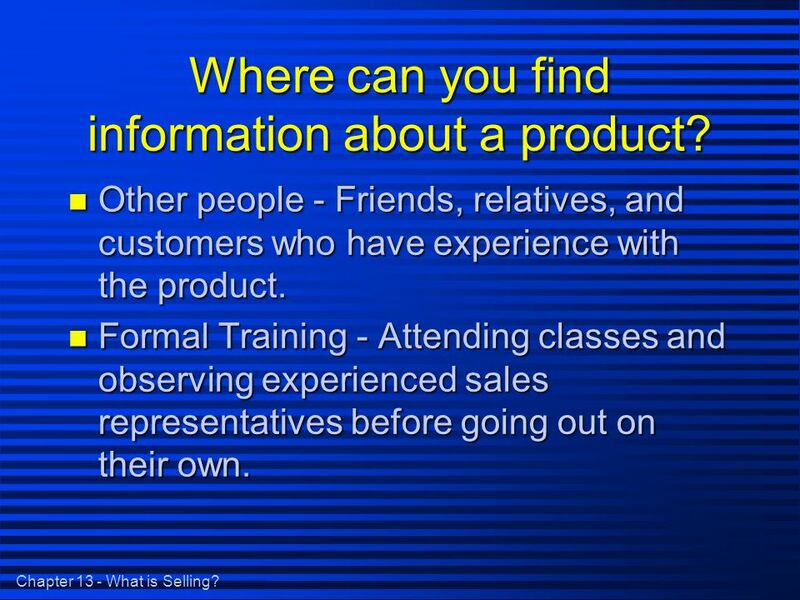 Questions n Give an example of a business that uses personal selling. 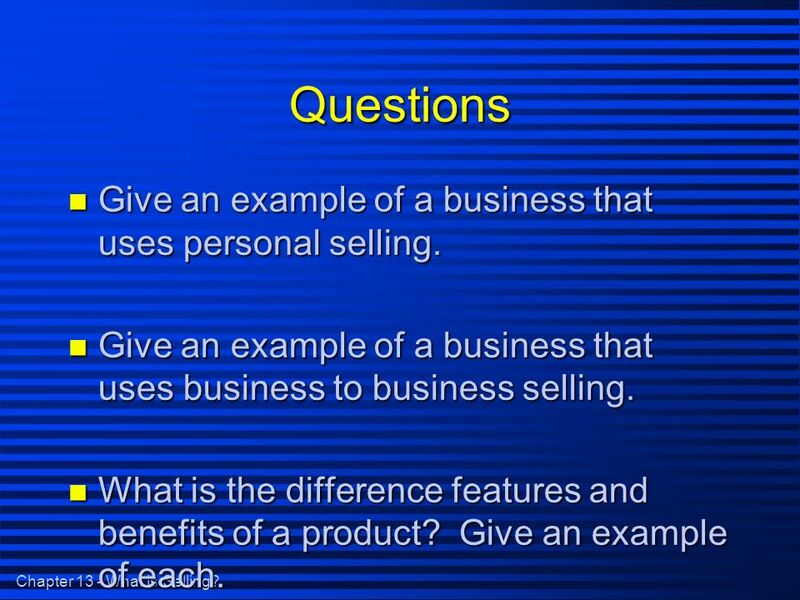 n Give an example of a business that uses business to business selling. n What is the difference features and benefits of a product? Give an example of each. 22 Chapter 13 - What is Selling? 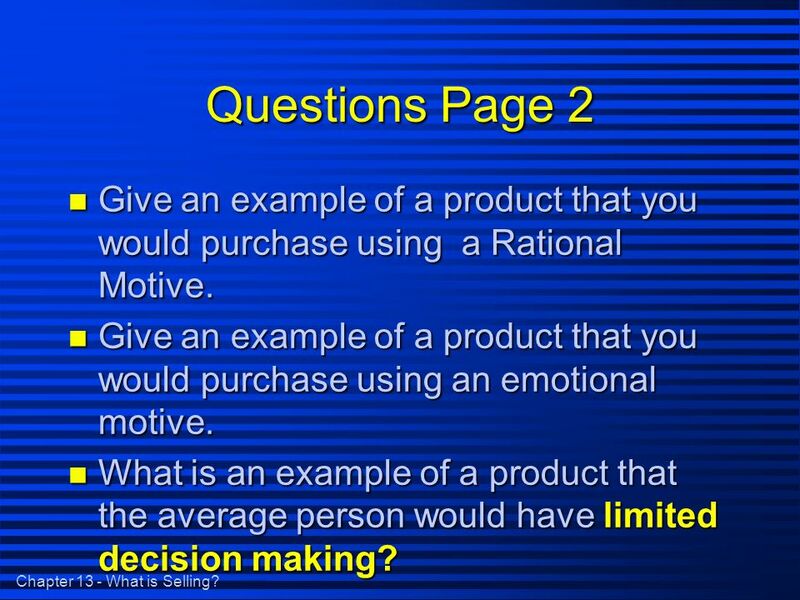 Questions Page 2 n Give an example of a product that you would purchase using a Rational Motive. 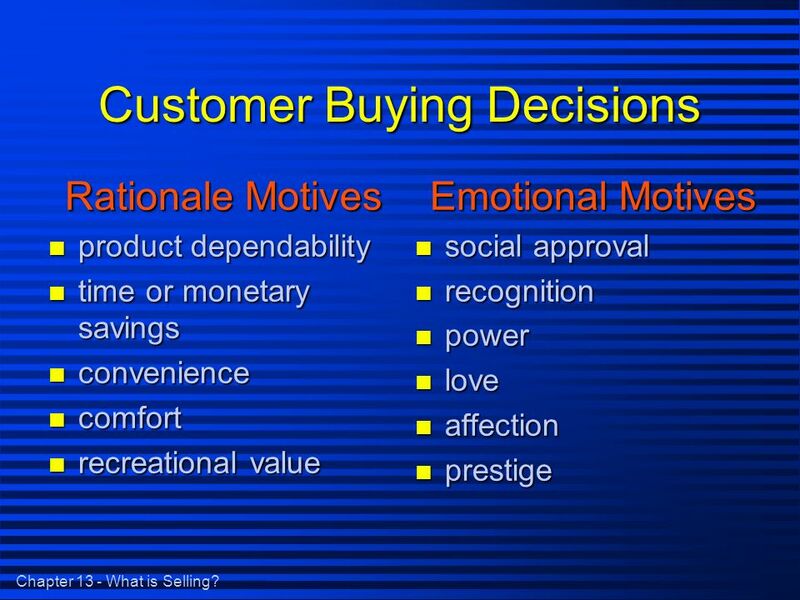 n Give an example of a product that you would purchase using an emotional motive. n What is an example of a product that the average person would have limited decision making? 23 Chapter 13 - What is Selling? 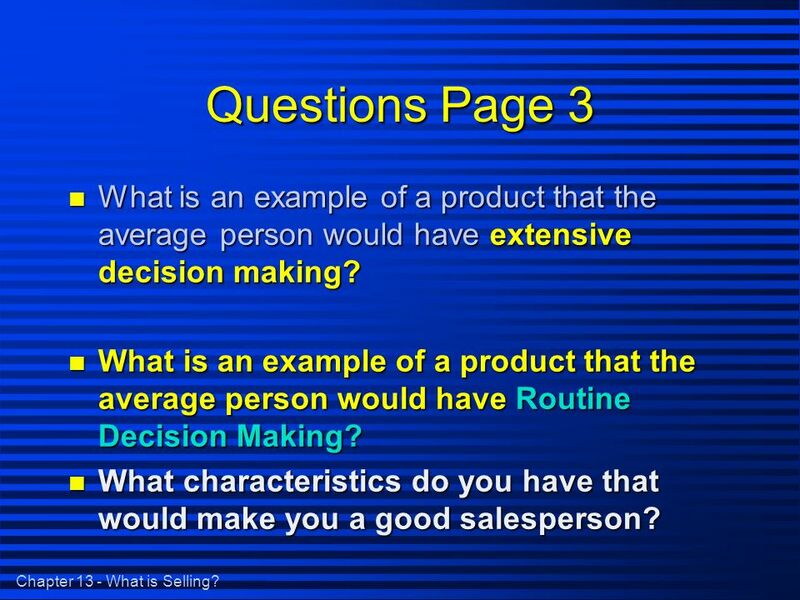 Questions Page 3 n What is an example of a product that the average person would have extensive decision making? n What is an example of a product that the average person would have Routine Decision Making? 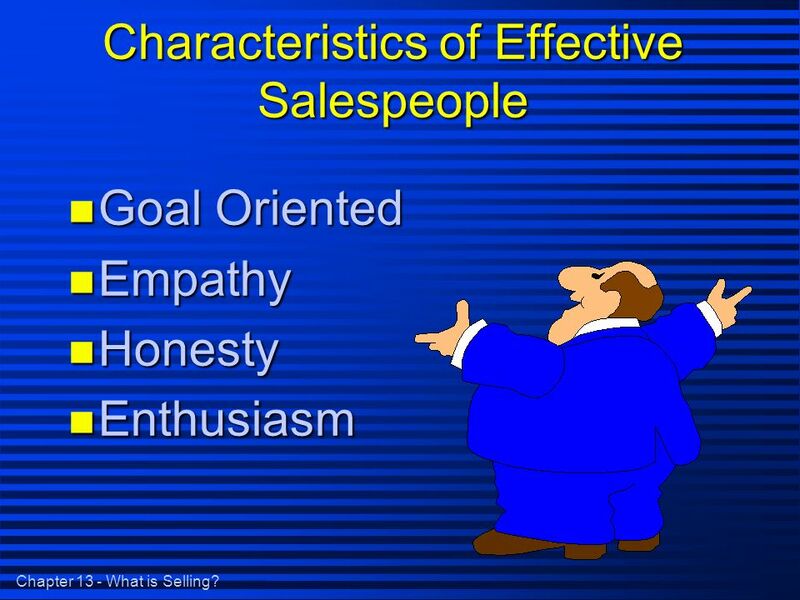 n What characteristics do you have that would make you a good salesperson? 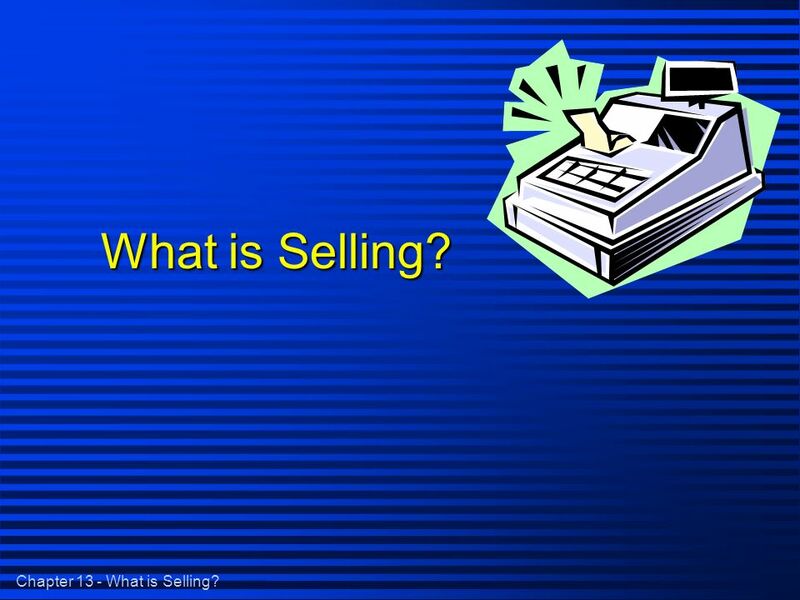 Download ppt "Chapter 13 - What is Selling? 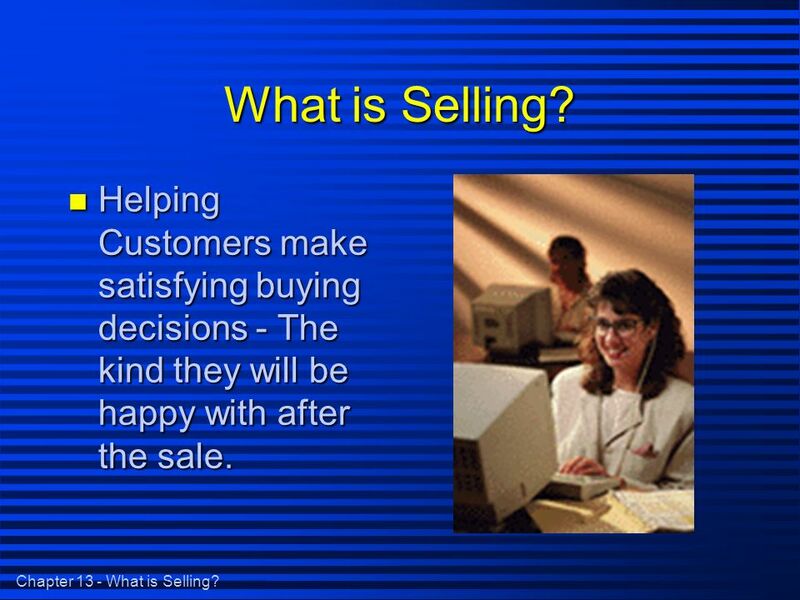 What is Selling?. Chapter 13 - What is Selling? What is Selling? n Helping Customers make satisfying buying decisions -"
Preparing for the Sale Chapter 12 covers how a salesperson prepares for a sale. Its so new we dont know what it does, but nobody else has it so were selling the hell out of it. Indicator 2.01 – Acquire the foundational knowledge of selling and understand its nature and scope. Marketing. 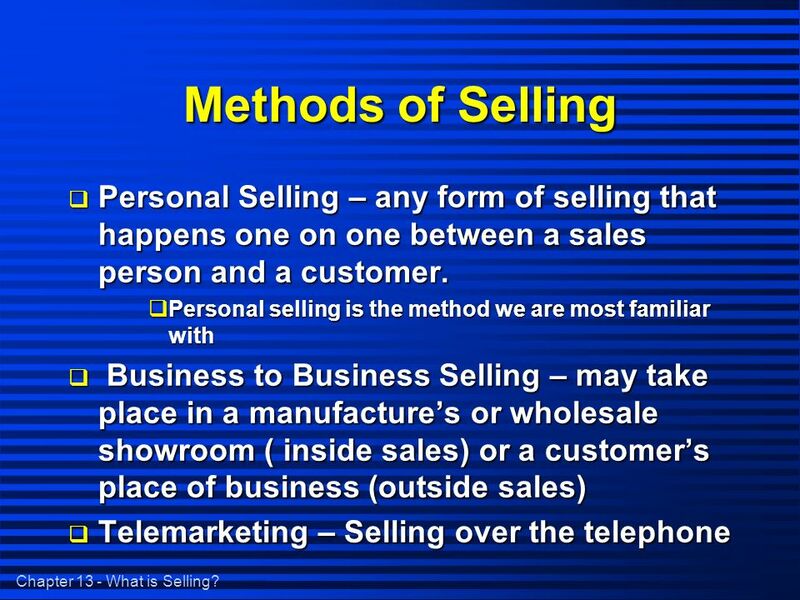 What is Selling Personal Selling is any form of direct contact between a salesperson and a customer Retail Selling Business-to-Business Selling Telemarketing. What is Selling? By: Rachael McClain. What Is Selling?  Selling involves providing customers with the goods and services they wish to buy.  Selling. What Is Selling? 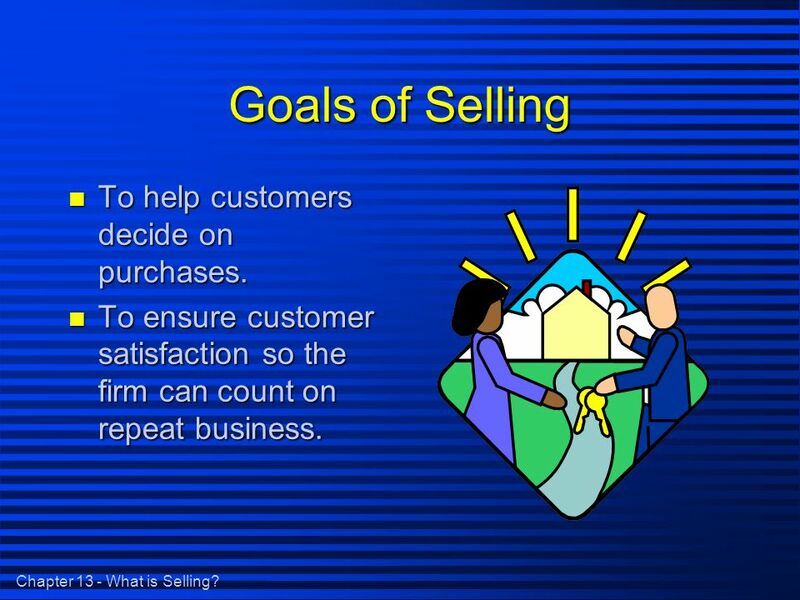 n Selling involves providing customers with the goods and services they wish to buy. n Selling is helping customers make satisfying buying. Sales Careers. 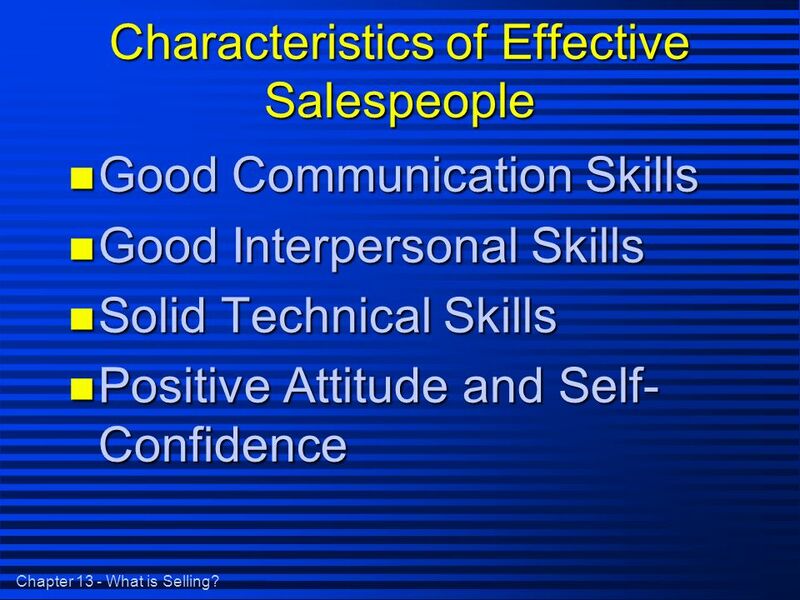  Personal Selling is any form of direct contact between a salesperson and a customer.  The key factor that sets it apart from other forms.  When was the last time you purchased something with the help of a salesperson?  What was the item and how did the salesperson help you?